Make a Profit not a Loss! 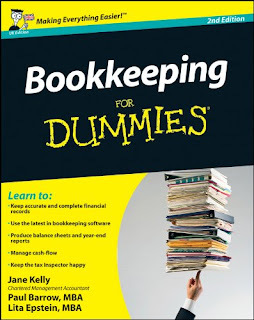 Although I am no expert, I have completed an accounting (AAT) and a bookkeeping course (RSA) before, several years ago (and I know more about bookkeeping than bee keeping, that's for sure!) However, I felt my current circumstances would benefit from a refresher course and that's exactly what I got and more. In true "Guides for Dummies" style, Chartered Accountant Jane Kelly, ACMA, and Finance Expert, Lita Epstein, MBA, share their joint knowledge through interactive exercises, which demonstrate a wide variety of financial transactions and highlight the problems that can occur. From the bookkeeping basics (discovering your business type, understanding terms and day-to-day transaction management) through to the more advanced (corrections of ledgers, P&L statements and the "Top Ten Problems to Practise") it's a workbook packed with information, samples and solutions with that famous touch of humour to make it more fun and less of a number-crunching chore. A great reference and workbook to keep close by for anyone starting a business, or needing a refresher course produced by the popular "Dummies" brand many of us already know and trust and it gets top marks from me for what I need. Whether it is suitable for accounting professionals these days, I am uncertain, but if in doubt please check with your tutor.